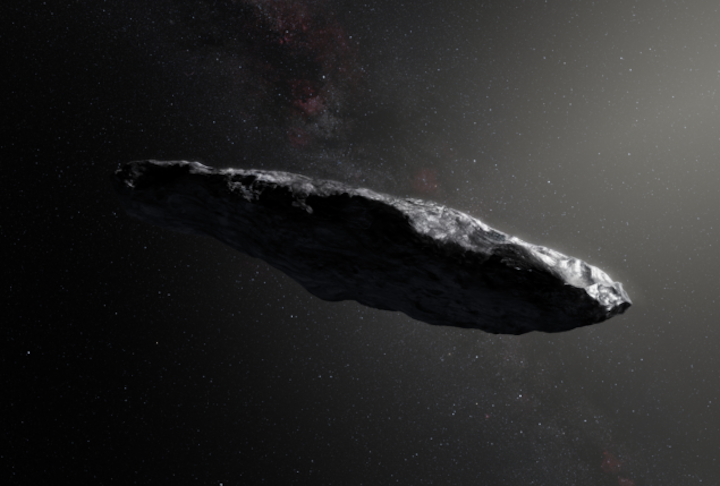 Is the cigar-shaped interstellar object ‘Oumuamua a comet or an asteroid? In the latest installment of this ongoing debate, Roman Rafikov at the University of Cambridge, UK, argues that the mysterious object is far too rotationally stable to have comet-like ejections of gas. His conclusion is at odds with a previous study of ‘Oumuamua, which suggested that the trajectory of the object is being affected by outgassing. Whether ‘Oumuamua is a comet or an asteroid could have important implications for understanding where the object came from. In October 2017 the Hawaii-based Pan-STARRS survey telescope spotted a highly elongated, 230 m-long object that astronomers soon realized had originated from outside the solar system. Named after the Hawaiian word for “scout” to commemorate its interstellar voyage, ‘Oumuamua has both a highly eccentric orbit and a shiny surface, leading some astronomers to identify the object as a comet. However, the lack of a coma of gas and dust around ‘Oumuamua suggested to others that it is an asteroid. In a study published earlier this year, researchers led by Marco Micheli at the European Space Agency measured ‘Oumuamua’s trajectory through the solar system and concluded that its motion cannot be explained by gravitational forces alone. Rather, they argued that the object is being accelerated by the propulsive effect of gas being released as the object is heated by the Sun. Such outgassing is a hallmark of a comet. Regarding the lack of a coma, Micheli and colleagues speculated that the object’s surface could have been modified during its long journey to the solar system. Now, in a preprint uploaded to arXiv, Rafikov describes how he has analysed precise astrometric measurements of ‘Oumuamua’s motion that have been gathered since the object was first spotted last year. Rafikov points out that if ‘Oumuamua is ejecting gas like a comet, the resulting torques on its cigar-like form would cause its rate of rotation to accelerate rapidly. In just a few days, he adds, rotational forces would tear the object apart. In contrast, the astrometric data show that ‘Oumuamua’s rotation is stable over timescales of many months. Rafikov argues that this suggests that gas is not being ejected. When combined with the lack of an observed coma around ‘Oumuamua, Rafikov believes his analysis suggests that ‘Oumuamua should not be classified as a comet. This could have important implications regarding the origins of the object. Unlike asteroids, comets in the solar system have highly eccentric orbits making it much more likely that a comet could be ejected into interstellar space. Asteroids, on the other hand, tend to have tighter and more circular orbits. Therefore, if ‘Oumuamua came from an extrasolar planetary system like our solar system, it is much more likely to have begun its journey as a comet. The ejection of an asteroid from an extrasolar system is much less likely and could involve a violent event such as the explosion of a star.